O-Town was an American boy band formed from the first season of the MTV-produced reality television series “Making The Band” in 2000. 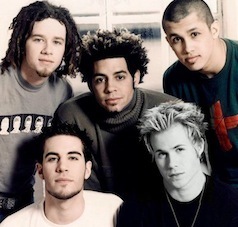 The members of the band were: Jacob Underwood, Ashley Parker Angel, Erik-Michael Estrada, Trevor Penick, and Dan Miller. After releasing two albums near the end of the boy band fad of the late 1990s and early 2000s, the group disbanded in 2003. Some of their songs remain popular as cover tunes by other groups. The group was originally managed by Lou Pearlman during their first season of Making the Band, but later managed by Mike Cronin and Mike Morin for their debut album and remaining television seasons. Ikaika Kahoano was originally one of the five members selected but an undisclosed dispute caused him to back out, making way for Dan Miller who was selected by the four remaining members. The ratings of Making the Band were strong enough to warrant a second (and eventually third) season, which made O-Town the first cast of a reality TV show to remain the same on their second and third seasons. These subsequent seasons depicted their development as a pop group, following tours, performances, etc. Such events included the development of their second CD, O2, their transition to a new record label (Clive Davis’ J Records), and an ongoing struggle to prove themselves as legitimate artists. The third season of Making the Band was broadcast on MTV, instead of the original network, ABC. Their first album, the self-titled O-Town, sold more than two million copies. Their first single, “Liquid Dreams,” was the first single to reach #1 on the Billboard singles sales chart without making the Airplay chart. The single managed to peak at #10 on the Billboard Hot 100 chart. In the late spring of 2001, O-town released “All or Nothing”, and the song became their biggest hit of their career as a group. “All or Nothing” reached #3 on the Billboard Hot 100 and the song was nominated for numerous awards, including “Song of the Year” during the 2001 Radio Music Awards. The success of “All or Nothing” granted them the ability to air another season of Making the Band. Near the end of the third season, O-town fans and television viewers watched as they tried to take their careers to the next level by writing their own music, earn the respect of their industry peers, and market themselves beyond being labeled as a “boy band”. Unfortunately, their second album, O2, was delayed numerous times, and as time between their last U.S. single, the moderately successful “We Fit Together”, and the anticipation of “O2″, without any new singles to put on radio and no more new episodes of Making the Band, the notoriety of O-town in the media began to wane. Sales of O-Town’s second album, O2, were below expectations. Their debut single for O2, “These are the Days” eventually broke into the Billboard Top 40 at #40, and critics, such as those from Billboard.com, praised their second single, “I Showed Her” for being a well developed song. Despite this moderate success, “O2″ was nowhere near the commercial success of their first album, O-Town, and the band went on tour in the summer of 2003 to promote the album. J Records dropped the band from the label in November 2003. Though fans tried to organize campaigns to get O-Town signed to a new label, these efforts were met with little success. As a result, the group disbanded in late 2003, and O-Town sent a personal e-mail to all their fans, via O-town.com, thanking them for the great memories and experience they shared with them. Within the personal e-mail to their fans, O-Town, themselves stated that they disbanded due to the changing of times (in the music industry) and financial problems, which had a hint to some fans that Lou Pearlman and Pearlman’s company, Trans Continental, perhaps may have had some involvement with O-town’s financial issues (Pearlman has already had many legal problems with previous acts associated to his company, Trans Continental, such as the Backstreet Boys, ‘N Sync, and Aaron Carter). The members of O-town have moved on to solo careers. The most successful member of the group has been Ashley Angel, who signed on to Universal’s Blackground Records, and was also given his own reality show with MTV, There and Back. Ashley’s debut solo album was released in 2006 debuting at #5 on Billboard and receiving many positive reviews. The first single release, “Let U Go,” was a hit; its video spent weeks at #1 on MTV’s TRL and the single had the third-highest-selling debut of 2006. In January 2007, he began playing the role of Link Larkin in the Broadway production of Hairspray. Ex-bandmate, Trevor Penick, now professionally known as “Tre Scott”, has been signed to Mach 1 Music, working with industry top producer Eddie Galan. Jacob Underwood has his own band called “Jacob’s Loc”. He’s now writing a new album on 2010. Erik-Michael Estrada is writing as well. And Dan Miller is doing his own staff in the music business. *More info on their solo careers can be found on their personal sections.